Jessying - Malaysia Beauty Blog - Skin Care reviews, Make Up reviews and latest beauty news in town! : Register to get your Hada Labo Sample ! Register to get your Hada Labo Sample ! I am sure all of you have heard how good is Hada Labo! I haven't got the chance to try it myself. Because they are giving out samples! 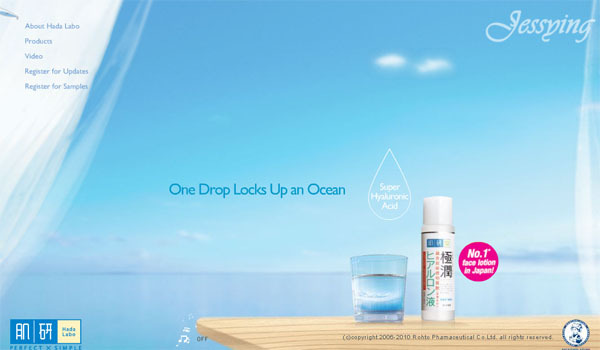 Go to Hada Labo's website here and register yourself to entitle to Hada Labo's Super Hyaluronic Acid Moisturizing Lotion 9ml to be sent to you. This is only available only in the month of June 2010 and while stocks last.. Hurry up register for it! p/s: Thanks to my little birdie reader who share this with me! Am I excited to get this to try out !! Freebies..Good, I'm going to finish mine soon.